The looters and moochers in Washington are increasingly agitated by the prospect of sequestration. Automatic budget cuts, we are told, will indiscriminately slash vital programs and undermine economic growth by reducing government spending. This is utter bunk. I would like to “slash vital programs,” but the chart I prepared earlier this week shows that the federal budget will expand by $2.4 trillion if a sequester occurs. So the net effect of sequestration, as I explain in this Larry Kudlow segment on CNBC, is that the federal budget won’t expand by $2.5 trillion. I did this interview from London, by the way, where is was past midnight, so I hope you’ll forgive me for looking a bit groggy at the very beginning. But I think I did a decent job once the juices started flowing, though it’s hard to have an argument with someone who still believes in the snake-oil of Keynesian economics. It’s sort of like having a debate about sailing with someone who thinks the earth if flat. Just like Krugman, Bernstein seems to reflexively think that it’s always a good idea to have a higher burden of government spending. So a sequester is a bad idea if you have this mindset, just like it would be a bad idea to sail off the edge of the earth. The Wall Street Journal recently opined on this issue and was appropriately dismissive of the hysterical anti-sequester rhetoric coming from Washington. 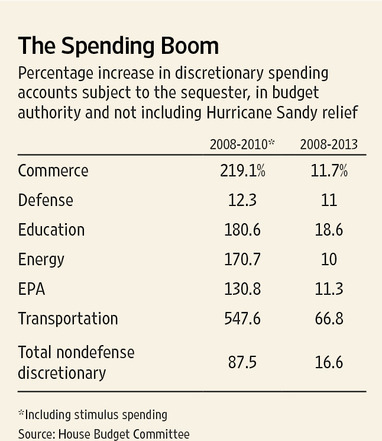 Washington is in a fit of collective terror over the “sequester,” aka the impending across-the-board spending cuts. …Mr. Obama warned about “the threat of massive automatic cuts that have already started to affect business decisions.” He proposed tax increases and “smaller” spending cuts to replace the sequester… listening to his cries of “massive” cuts is like watching “Scary Movie” for the 10th time. You know it’s a joke. Indeed, I suspect that many Democrats realize it is a joke. But they see the federal budget as a mechanism for buying votes with other people’s money. Many GOPers see the budget from the same perspective, but fortunately they are constrained by their no-tax-hike pledges, so they Republicans at least are pretending to be on the right side of this fight. Republicans have rightly concluded after two years of being sucker-punched that the sequester is the main negotiating leverage they have and may be the only way to restrain spending. So now Democrats and a gaggle of interest groups are denouncing Mr. Obama’s fiscal brainchild because the programs they cherish—from job training to education, to the EPA and energy subsidies, to money for Planned Parenthood—are about to get chopped too. Fear not. As always in Washington when there is talk of cutting spending, most of the hysteria is baseless. The nearby table from the House Budget Committee shows that programs are hardly starved for money. In Mr. Obama’s first two years, while private businesses and households were spending less and deleveraging, federal domestic discretionary spending soared by 84% with some agencies doubling and tripling their budgets. The WSJ shares my disdain for the Keynesian argument, and they explain that the last period of strong growth took place during the late 1990s, when Bill Clinton and the GOP Congress substantially reduced the burden of federal spending. The most disingenuous White House claim is that the sequester will hurt the economy. Reality check: The cuts amount to about 0.5% of GDP. The theory that any and all government spending is “stimulus” has been put to the test over the last five years, and the result has been the weakest recovery in 75 years and trillion-dollar annual deficits. The sequester will help the economy by leaving more capital for private investment. From 1992-2000 Democrat Bill Clinton and (after 1994) a Republican Congress oversaw budgets that cut federal outlays to 18.2% from 22.1% of GDP. These were years of rapid growth in production and incomes. The sequester will surely require worker furloughs and cutbacks in certain nonpriority services. But most of those layoffs will happen in the Washington, D.C. area, the recession-free region that has boomed during the Obama era. The federal metropolis now has the biggest concentration of America’s richest counties. The lobbyists, politicians, interest groups, and overpaid bureaucrats are living very nice lives at our expense. So let’s not just have a sequester. Let’s joyfully embrace it. P.S. In the Kudlow debate, Jared was right about CBO’s position. This, of course, is one of the reasons why the GOP should de-fund this ideologically biased bureaucracy. P.P.S. Just as the U.S. enjoyed strong growth when spending was restrained in the 1990s, other nations had very positive results when they capped or froze government spending. P.P.P.S. By contrast, here are the nations that enjoyed good results with Keynesian policy. Getting Federal spending down to 18.2% of GDP seems like a pipe-dream at this point. Going to be even harder without entitlement reform. We all know there is zero chance of Obama and the Senate Democrats cooperating on entitlement reform (including welfare reform). Someone half-convinces a group of alcoholics to skip drinking for a few days. “Don’t quit, it’s going to be ugly warns the group leader”. Sure enough, in a body half adapted to living from the pernicious metabolism of alcohol, abstaining for a few days precipitates the predictable withdrawals. They go back to drinking, ridiculing and declaring the whole cessation attempt as a dumb idea. They go back to listening to their leader, deepening their destruction. But what is needed is not drinking cessation for a few days. It is permanent reduction of alcohol consumption. Like the alcoholics, the lemmings, voter-lemmings that is, will have to ride the path they chose all the way to the bottom. This seems like the only way to get any sort of handle on excessive – abusive – federal government spending.